@amandakphotoart #pvtakeover Day 3: L O V E. I am in the business of love. How great is that?! I wholeheartedly adore my job, and am committed to being a light and encouragement to not only my clients, but other creatives in this industry. There is nothing more exciting to me than to receive those emails from couples inquiring about their big day! Connecting with them on a deeper level and learning about their love story is integral to the direction I take with their wedding day and engagement portraits. While giving direction is important, I never want to force anything, but allow the moments to present themselves to me naturally and truthfully. When you have a couple who is over the moon in love in front of your lens, that is all the inspiration you need. Love is the theme I want to be present in all of my work. 📷 on #fuji400h with a #pentax645nii at client's family farm in Crescent City, California. @amandakphotoart #pvtakeover Day 3: S I M P L I C I T Y. I am a “less is more” kind of girl. I believe in quality over quantity, and that is how I like to approach my weddings and portraits. Whether I am shooting film or digital, I try to shoot with intent. I want each frame to be a keeper!! (That doesn’t always happen BTW.) This also saves me from hours of culling! In the beginning of my career, I would arrive to a wedding with a long list of my "must have" shots, 4 cameras, 6+ lenses and so on. I have since learned to completely simplify, and that was a game changer! One of my favorite things about shooting with my Pentax645Nii, is the simplicity of it. All I have on me during engagements and the couple's wedding day portraits, is my Sekonic handheld meter, and my film camera with one lens. This allows me to really be in the zone without being distracted by all the gear hanging off of me like a pack mule! I am also very nature inspired—I love to use the natural beauty of the environment to frame my subjects. A clean, simple background is EVERYTHING. A great example of this was a recent HMUA editorial I shot for @austieeckley. I brought one film camera, had my digital for a backup (always be prepared! ), two lenses, and film. We went into this shoot with some ideas and inspiration, but ultimately we wanted a very minimal aesthetic so that the make-up was the star. 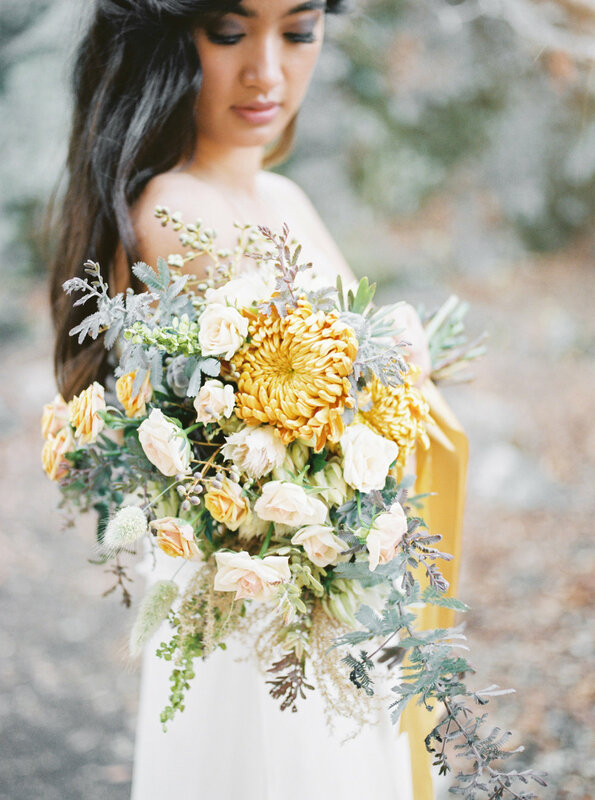 Tiffany of @foragedfloral brought all these incredible blooms as inspiration, and I had her sprinkle Courtney’s curly locks with these little blossoms. They added softness and femininity to the image without distracting from the subject. Simplicity at it’s finest. I absolutely LOVE how it turned out! 📷 on #fuji400h with a #pentax645nii at @studio_1904 in Portland, Oregon. If you are interested in continuing to follow along on my journey head on over to @amandakphotoart! AND to express my gratitude I am hosting an exciting #giveaway! Check out my latest post to learn how to enter! 📷 on #fuji400h with a #pentax645nii at #sanysidroranch in Santa Barbara, California. As seen on @inspiredbythis and nominated for @bellelumieremagazine 2016 image of the year.